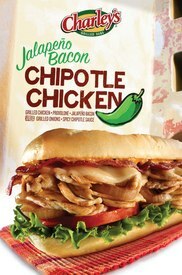 Charley's Grilled Subs, known for their signature Philly Steak sandwiches, is getting ready to introduce a Jalapeno Bacon Chipotle Chicken Sandwich nationwide on May 21, 2012. The Chipotle Chicken Sandwich is hot, fresh and made-to-order with sizzling chicken, all natural provolone cheese and sauteed onions. Complimenting the flavors, the sandwich is layered with Ancho chipotle sauce and topped off with mouth-watering jalapeno bacon strips -- sure to fire up taste buds and consumer palates all over the nation. Moreover, while supplies last, Charley's is offering three additional strips of jalapeno or regular bacon on any sandwich for just $1. Recognized for being proactive in responding to customer demands, Charley's Grilled Subs offers quality and flavorful menu items that consumers find unique and innovative. "We are excited to introduce this twist on a Philly Steak," said Chung Choe, Charley's head of Research and Development. "We know our customers will go crazy over the Jalapeno Bacon." Offered for a limited time only, the Chipotle Chicken Sandwich is available May 21 through June 24. 450 locations worldwide in 46 states and 16 countries. Founded in 1986, more than 90 percent of all Charley's Grilled Subs restaurants are run by franchisees. For more information, go to www.Charleys.com.